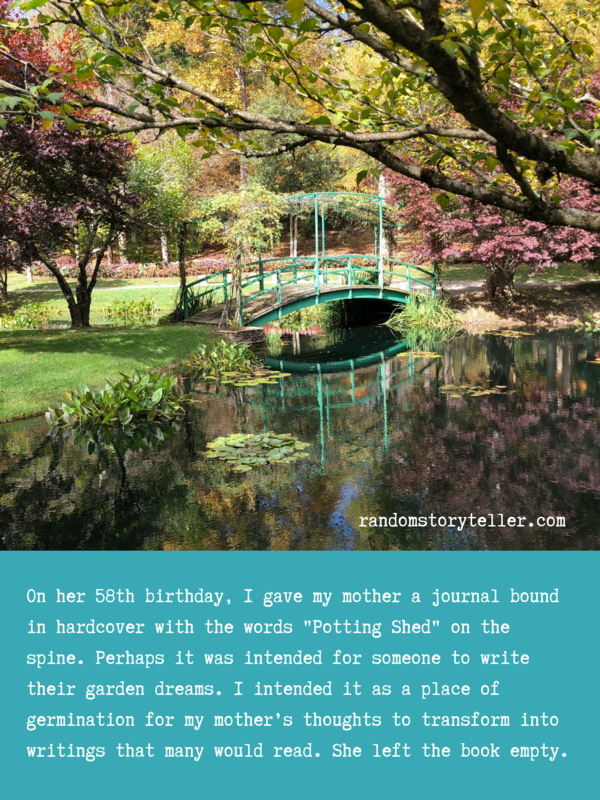 On her 58th birthday, I gave my mother a journal—bound in hardcover with the words “Potting Shed” on the spine. Perhaps it was intended for someone to write their garden dreams. I intended it as a place of germination for my mother’s thoughts to transform into writings that many would read. She left the book empty. Mom stacked containers of soup in the freezer—always ready to dispatch to a family needing a dose of homey goodness, a bowl of steaming comfort food prompted by a script written in the heart: TLC, or tender, loving care. Mom never kept a scorecard of her good works. Indeed, she turned the spotlight on others. She saved the crude paintings and overly sentimental scribblings of my childhood. Mom handed me the beauty of poetry at an early age, so its rhythm came to me as readily as heartbeats. She fed her young children a steady diet of nursery rhymes and literary classics. I remember clapping to verses. She read aloud with vivid expression while one of us turned the pages. As I grew older, she sometimes bookended observations about life with her favorite lines from Shakespeare, Wordsworth, Keats, Tennyson, and Frost. Time is fleeting. The family home has passed to strangers. The children have scattered, in the autumns of their lives. Yet I remember the constant of my mother’s life. What would she have said about the stream of articles and newscasts that warn of tribalism cracking apart lifelong relationships at the Thanksgiving table? I imagine a sensible answer: “That’s a choice—to allow the fear, grudges, insults, and cruelty of the disgruntled to violate home and hearth.” All her life, she forgave those who hurt her—with the gentle capacity to truly let go. 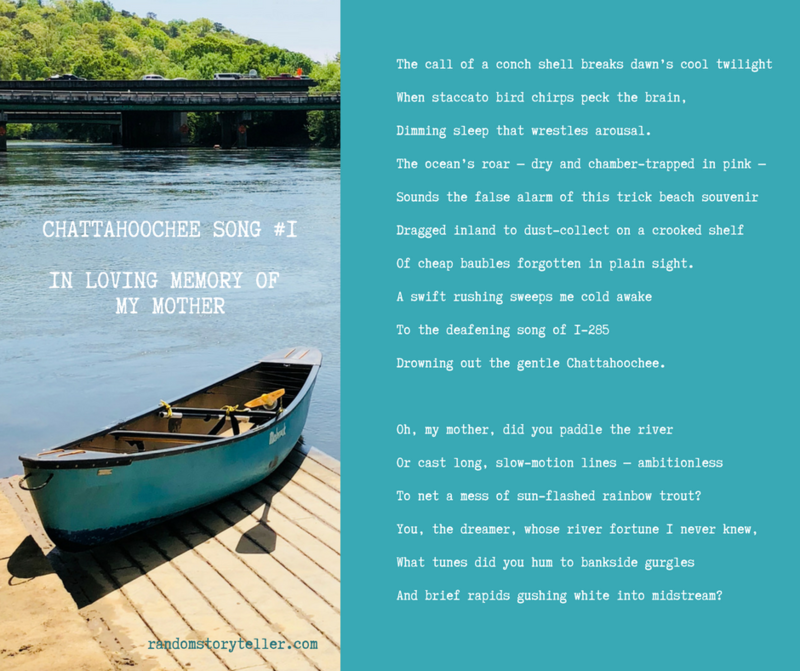 Even at Thanksgiving, she could turn her grief into a simple song—as she did when she penned the following essay on the first holiday without her mother. Yes, Bunny, I will fill the pages of your journal with your familiar strains—and the ones I never heard, until now. Now, I looked at the finished turkey embellished with parsley—staring blankly at it all and the platter once again holding the center of the holiday feast. Indeed, I thought, it would be a very tasty feast, but somehow it wasn’t the same. I wondered whether Mama would have been pleased with its appearance—probably so. I quickly carried it to the table, not daring to tarry with reminiscences of the platter and past turkeys. There is something almost holy about pieces of furniture, jewelry, silver, or china handed down for a long time. The Haviland platter—an unusually large size and part of quite a large collection of china—was first a wedding gift to my grandmother. The first turkeys that graced it for holiday dinners were undoubtedly wild ones killed by some unknown hunter in Tennessee. I wondered what garnish, if any, was used. Certainly, parsley was not available in November and December. I am sure my own mother added that touch. She bought her bird from the market in Atlanta already killed and dressed—but fresh. Every Thanksgiving and Christmas that I recall, we had a beautifully cooked turkey placed on the revered platter and adorned with parsley—I can remember a few times young celery leaves. I will never know whether that was because money was scarce to buy “extras” or whether the parsley was scarce! My father always praised the beautiful bird and then began the slow and painstaking ritual of carving. I can still remember watching with watering mouth and hunger pangs, as Mama never allowed a nibble after breakfast so we would “save up” to enjoy the feast. My portion was always the giant drumstick with some of the meat cut off. My father, looking through his bifocals, carefully carved, and in his own manner, he made it something of a theatrical production. My own surgeon husband carves with deft strokes, and behold, it is done in record time. 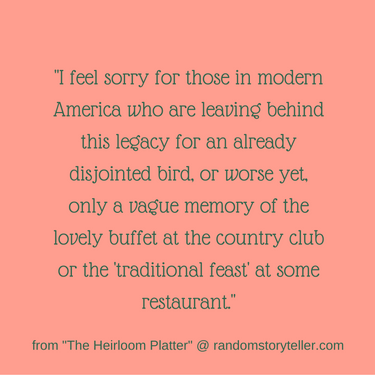 Either way, I feel sorry for those in modern America who are leaving behind this legacy for an already disjointed bird, or worse yet, only a vague memory of the lovely buffet at the country club or the “traditional feast” at some restaurant. Something is lost when you never know the crisp brown of the turkey skin stretched tightly between thigh and breast or have the fun of a child (or an adult) pinching in hidden places the succulent morsels underneath “where it doesn’t show.” I am thankful for the cherished platter and for all the memories of past holidays that it holds. Some holidays and some turkeys were better than others. Nevertheless, the platter still holds in our family a special sense of awe. It is a beautiful circle. You come from Good stock! I cheated and bought a pre-cooked Turkey tonight. Happy Thanksgiving.